Z Elnasser, A Maraqa, W Owais, A Khraisat. Isolation and Characterization of New Thermophilic Bacteria in Jordan. The Internet Journal of Microbiology. 2006 Volume 3 Number 2. Purpose: to investigate the microbial community in the hot springs of Jordan. Identification systems were used based on biochemical, morphological characteristics and optimization of growth conditions. The 16S rRNA gene sequence for the wild type isolate (% GD) was 0.56%, gene alignment with GenBank resulted in a percent identity (% ID) with closest GenBank match of 98% suggesting that the isolate is a new cluster within the branching of well defined genus Bacillus. The physiological characteristic of the wild type isolate varied over a wide range of conditions. It had a great ability to ferment different types of sugars as; glucose, fructose, manose, maltose, lactose, sucrose, trehalose, mannitol, melibiose, raffinose, xylose and cellobiose as a source of carbon, while it did not ferment xylitol and arabinose. Conclusion: a new wild type aerobic gram-positive rod-shaped strain of thermophilic bacteria 'Bacillus justea I' was isolated. Since thermophilic microorganisms prefer living at temperatures not commonly found in nature, but in hot springs and water heaters, their preference for hot temperatures has given rise to some speculation about their evolution. One theory suggested that the thermophiles were among the first living things on this planet, developing and evolving during the primordial birthing days of earth when surface temperatures were quite hot, and, thus, had been called the “Universal Ancestor” . Estimated at 3.6 billion years old, they are said to be as abundant as to “comprise as much as half of all living things on the planet” . Environment that is considered by man to be extremes is colonized by special microorganisms which are adapted to the ecological niches. These organisms are called extremophiles and might be divided into five categories; thermophiles, acidophiles, alkophiles, halophiles, and psychrophiles. This clearly indicated the nature of habitats used by these microorganisms . The thermophiles are defined as organisms capable of living at high temperature. These organisms do not only survive but might even thrive in boiling water . As of their cellular components, proteins are inherently more stable to heat than those of conventional organisms called “mesophiles”. This thermal stability is not due to any specific characteristic but resulted of a consequence of various changes which contribute to the whole stability of the protein in additive manner . The ability of thermophilic bacteria to grow at high temperature and to produce stable extracellular enzymes was attributed to the probability of increasing their enzyme excoriation and activity by means of genetic manipulation. Therefore, these microorganisms were the first candidates for massive enzyme production for industrial applications . The aim of this study was to isolate and identify thermophilic bacteria in Zara and Main hot springs of Jordan. Different new methods were used in conjunction with more molecular and traditional approaches. Water samples were collected from twenty main thermal springs located in Zara and Main areas in Jordan using 200 ml sterile thermal glass containers. The samples were collected under 40cm below the surface, away from the margin in order to be representative samples . Thermophilic bacteria were isolated and purified using the streaking method on thermus agar (ATCC medium 697) containing 0.5% NaCl, 0.5% peptone, 0.4% beef extract, 0.2% yeast extract and 2% agar, the pH of the medium was adjusted to 7.0 before autoclaving plates were incubated at 60°C for 24h, and purity of the colonies were checked microscopically . Prototrophic strains “Wild type” of Thermophilic bacteria are able to grow on a minimal medium containing only mineral salts and a carbon source while the desired mutants cannot grow on the same medium. All pure colonies were cultured on minimal medium and incubated for 48 h at 60 °C . The 16S rRNA gene was PCR amplified from genomic DNA isolated from pure bacterial colonies. [The primers used for sequencing correspond to positions 5, 338, 357, 515, 531, 776, 1087, 1104, 1174, 1193, and 1540 in the E. coli 16S rRNA gene] (full length packages) and 005 and 531 (500 bp packages). Amplified products were purified using Microcon 100 (Millipore) molecular weight cut-off membranes and checked for quality and quantity by running a portion of the products on an agarose gel. Cycle sequencing of the 16S rRNA amplification products was carried out using AmpliTaq DNA polymerase and dRhodamine dye terminators. Excess dye-labeled terminators were removed from the sequencing reactions using a Sephadex G-50 spin column. The products were collected by centrifugation, dried under vacuum and frozen at -20 until ready to load. Samples were resuspended in a solution of formamide/blue dextran/EDTA and denatured prior to loading. The samples were electrophoresed on an ABI Prism 377 DNA Sequencer. Data was analyzed using Applied Biosystems DNA editing and assembly software and sequence comparisons are obtained using the MicroSeq software [10,15]. Morphological properties were investigated by using 18 hour old bacterial cultures growing on thermus agar plates. These included the wet mount preparations using light microscope Gram staining to confirm Gram reaction and spore position according to Hucker modification method . Motility was determined by hanging drop method . Electron micrograph was also done. The thermophilic isolate was identified by the use of conventional methods for the presumptive identification of endospore– forming Gram-positive rods supplemented by some physiological and biochemical tests listed in Table 1 and Table 2. These tests were; Gram reaction, catalase production, hydrolysis of protein, starch and lipid, and acid production from sugar [12,13]. Table 1: Percentage differences between our samples and the closest match. Table 2: Percent Identity, the percent similarity between this study isolates and closest in the GenBank. The optimum pH for growth was determined by using phosphate buffer, universal buffer, and Tris –HCI buffer to obtain different pH values in the range of 4.0 to 9.0 pH was confirmed using pH meter. The pH of the isolation medium was adjusted to get a final value of 6.5 before autoclaving. Cultures were streaked onto plates of thermus agar and incubated at a range of temperatures from 20-75°C. The plates were observed daily up to 5 days. Growth at Different Sodium Chloride Concentration. The experiments were carried out in Earlnmeyer flasks (300 ml) containing 100 ml of isolation medium prepared in a phosphate buffer at final concentration of 50mM and at a final salt (NaCl) concentration of 0.5%, 1.0%, 3.0%, 5.0%, 7.0%, and 10.0%. Flasks were inoculated using 1ml of 18h old bacterial cultures grown in isolation medium broth. Flasks were then incubated at 55°C in an orbital shaker running at 200 rpm. 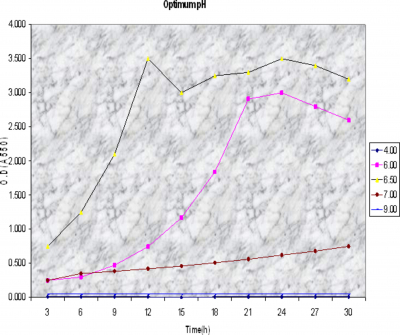 The growth was determined at 3h intervals by measuring the O.D at 550 nm. Determination of the Optimum Aeration rate. The experiments were carried out in an orbital shaker at speed of 100,150, 200,300, 400 rpm. The growth was determined in 3 hour interval by measuring the O.D at 550 nm. The isolates were cultivated in thermus broth containing 0.5 % NaCl (pH 6.5). Earlnmeyer flasks containing 100 ml growth medium was inoculated by 1ml of 18 hour growth culture, then incubated at 55°C in an orbital shaker running at 300 rpm. Optical Density at 550 nm was examined at 3 hour interval. The ability of bacterial isolate to hydrolyze casein was tested by streaking on skimmed milk agar plates containing (1.0% skimmed milk, 0.2 %yeast extract, 0.01 % KH2PO4, 0.03 %K2HPO4, 0.5 % NaCL and 2 % agar (PH6.5) and incubation at 55°C for 72h. The production of a clearing halo around the colonies indicated casein hydrolysis . Starch hydrolysis was tested on nutrient agar plates containing 1% starch (pH 6.5). Plates were incubated at 55°C for 24 hour. Appearance of clear halos around the colonies upon the addition of Lugol's iodine indicated the presence of amylase activity . Attempts to detect extracellular cellulose were made with thermus agar plates containing 0.5 %( w/v) carboxymethyl – cellulose (PH6.5). Cellulase activity was detected by flooding the plates (incubated at 55°C for 5 days) with 0.1(w/v) Congo red, the color easily stabilized by flooding plates with 1M NaCl. Clear zones around bacterial growth against red background indicated positive result . Out of 100 samples cultured, 17 samples grew on thermus agar, and one grew on minimal salt medium, the Isolate (wild type) were coded WI. The Isolate is Gram-positive and motile by peritrichous flagella (Fig. 1). Sporulation in the isolate was detected clearly under both light & electron microscope. 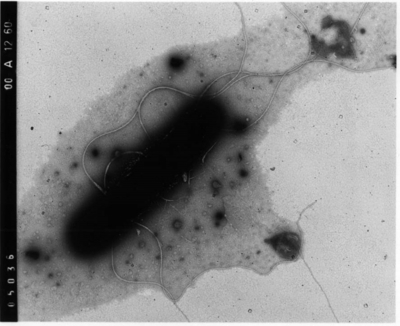 Figure 1: WI bacteria rod shape, motile by peritrichous flagellation (10000X). Sequence analysis was preformed using Applied Biosystems Microseq microbial analysis software and database. The top ten alignment matches are presented in a percent genetic distance format. In this format a low percent indicates a close match. (Fig. 2). Also provided with the report are neighbor joining phylogenetic trees. The trees are generated using the top ten alignment matches (Fig. 3). 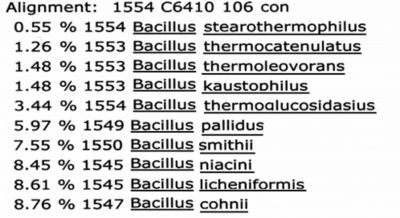 Figure 2: The top ten alignment matches for WI closest match is Bacillus stearothermophilus. Figure 3: Neighbor joining phylogenetic trees. The trees were generated using the top ten alignment matches. Concise alignments are also included; these illustrate positions that differ between our sample and the first match in the database. The position of the mismatch is read vertically from top to bottom and the sequences are read horizontally from left to right (Fig. 4). The new isolate is considered from the genus Bacillus, WI isolate close matches to Bacillus stearothermophilus. Percent Genetic Differences (%GD) is the difference between two sequences when aligned in a way to minimize sequence gaps. (Table1). Percent identity is the percent similarity between the samples and the closest GenBank match (Table 2). The fact that the Isolate is strictly aerobic microorganisms was further supported by the presence of catalase and oxidase activity in strain. The wild-type isolate was gram-positive and grew at pH rang 4~9. The growth temperature range of isolate WI was studied between 40 °C to 80 °C on thermus medium. The optimum temperature for growth was 55 °C (Fig. 5). Figure 5: Growth curve of WI isolate, growth occurred at 40°C to 80°C with an optimum temperature for growth of 55°C . The growth pH of isolate WI was studied between 4-9 on thermus medium. The optimum peak pH for growth was 6.5 (Fig. 6). Figure 6: Growth occurred at pH 4.0 to 9.0 in thermus broth. The optimum pH for growth was 6.5. Sodium chloride concentration for growth of WI was 0.5% to 3% on thermus medium. The optimum peak concentration for growth was 0.5% (Fig. 7). 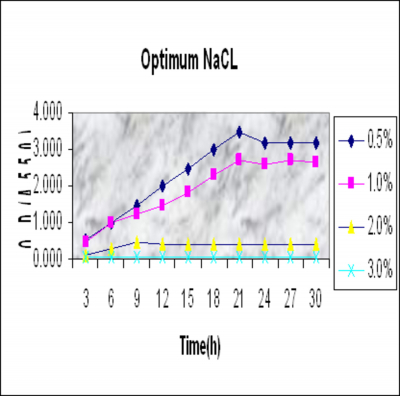 Figure 7: Growth occurred at 0.5% to 3% sodium chloride concentration The optimum concentration for growth was 0.5% to 1%. 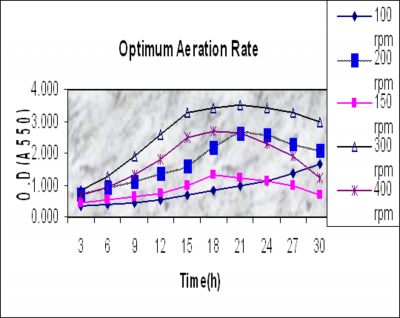 The optimum aeration rate for growth was 300 rpm (Fig. 8). In our study, the wild thermophilic isolate coded WI was selected from several Thermophilic isolates originating from thermal springs water of Zara and Main in Jordan. The isolate was as spore-forming bacilli. Species was chosen for further studies due to its ability to grow in minimal salt media and high ability to secrete extracellular protease enzymes during growth on suitable media such as skimmed milk. The bacterial isolate WI is rod shaped, and motile by peritrichous flagella (fig 1). The formation of spheroplasts seen in the isolated cluster is an important characteristic during the decline phase of growth. The chemotaxonomic methods employed did not allow further differentiation below the level of the genus. The new isolate is aerobic catalase-producing microorganism, distinguished by the formation of terminal cylindrical endospore, characterizing members of the family Bacillaceae. The WI has great ability to ferment different types of sugars and carbon sources. It was found that it can use glucose, fructose, manose, maltose, lactose, sucrose, trehalose, mannitol, melibiose, raffinose, xylose and cellobiose, as a source of carbon while it does not ferment xylitol and arabinose. 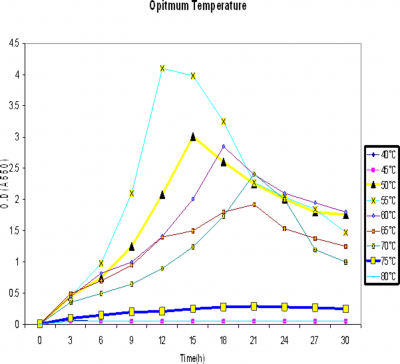 The physiological characteristics of the WI strain varied over a wide range of conditions (the incubation temperature, pH, aeration and NaCl concentration of the culture medium) the temperature was tested from 40 to 80 °C (optimum, 55 °C), pH 4.0 to 9.0 (optimum, pH 6.5), 0.5 to 6.0 % NaCl optimum 0.5 %), and aeration from 100 rpm to 400 rpm (optimum, 300rpm). The WI, subjected to 16S rRNA gene sequence studies, was placed in the genus Bacillus. The genus level match means that the sequence does not meet the requirement for a species level match but still clusters within the branching of well defined genus (Bacillus). Since we utilized phylogenetic trees to approximate the average inter-species %GD and have found through out extensive database building experience (>5 years) that it ranges from 0.5 % to 3 %, with an average of about 1 %. The isolate 16S rRNA gene alignment with GenBank resulted in a percent identity (%ID) with closest GenBank match of 98 %, indicating that there is no complete match between our isolate and GenBank deposits sequences. We conclude that we have isolated a new species of Thermophilic bacteria and suggest to name it Bacillus justea I. 1. Doolittle, W. F. (1999). Phylogenetic classification and the universal tree. Science, Vol. 284. 2124-2128. 2. Woese, C. R. (1998). The universal ancestor. Proc. Natl. Acad. Sci. USA 95:6854-6859. 3. Austain, B. (1988). Methods in Aquatic Bacteriology. A Wiley -Interscience Publication . 222-231. 4. Brock, T., (1986). introduction: an overview of the thermophiles. in: Brock, T. thermophiles: general, molecular, and applied microbiology, John Wiley and Sons, New York, 2-15. 5. Vieille, C. (1996). Thermozymes"Biotechnology annual review. 2:1-83. 6. Hisotsuyanagi, K. (1979). Stepwise introduction of regulatory genes stimulating production of α -amylase into Bacillus subtilis: Construction of α-amylase extrahyper producing strain. Agric boil chem. 43:2343-2349. 7. Khali. A, M. salim and A.K. Sallal, (1998). Enumeration of thermotolerant bacteria from recreational thermal ponds in Jordan", Cytobios. 57-63. 8. Tapan, K et al (1998). Oxidation of Methyl-Substituted Naphthalenes: Pathway in a Versatile Sphingomonas Paucimobilis Strain. Applied and Environmental Microbiology. 64. 1884-1889. 9. Yi-wel, Tang et al. (1998). Comparison of Phenotypic and Genotyping Techniques for Identification of Unusual Aerobic Pathogenic Gram-Negative Bacilli.. J. Clin. Microbiol. 36. 3674-3679. 10. Priest, f., Good, M. and Todd, C. (1988). Anumerical classification of the genus bacillus. Journal of general microbiology. Vol.134.184. 11. Mac, Faddin., J. F, (1980). biochemical tests for Identification of medical bacteria "2nd ed., Waverly Press Inc. U.S.A. 50-53. 12. Campos, L and Felix, C. R. (1995). Purification and Characterization of a Glucoamylase from Humicola grisea. Applied Environmental Microbiology.61. 2436-2438. 13. Tachibena, Y., et al. (1999). Purification and Characterization of an Extremely Thermostable Cyclomaltodextrin Glucanotransferase from a Newly Isolated Hyperthermophilic Archaeon, a Thermococcus sp. Applied Environmental Microbiology.65. 1991-1997. 14. Fujio, Y. and Kume, S. (1991). Characteristics of highly thermostable neutral protease produced from Bacillus stearotherrtmophilus. World Journal of Microbiology and Biotechnology.7. 12-16. 15. Lutz Fisher et al. (1995). Purification and characterization of thermotolerant β-Galactosidases from thermomyces lanuginose. Applied and Environmental Microbiology.61. 1497-1501.